Weather-wise, what a fantastic weekend for running: a little bit on the windy side (at least in the mornings), but clear and sunny and warm. Interesting to look at the numbers, since I ran the exact same 3.5-mile route in opposite directions on Saturday and Sunday. 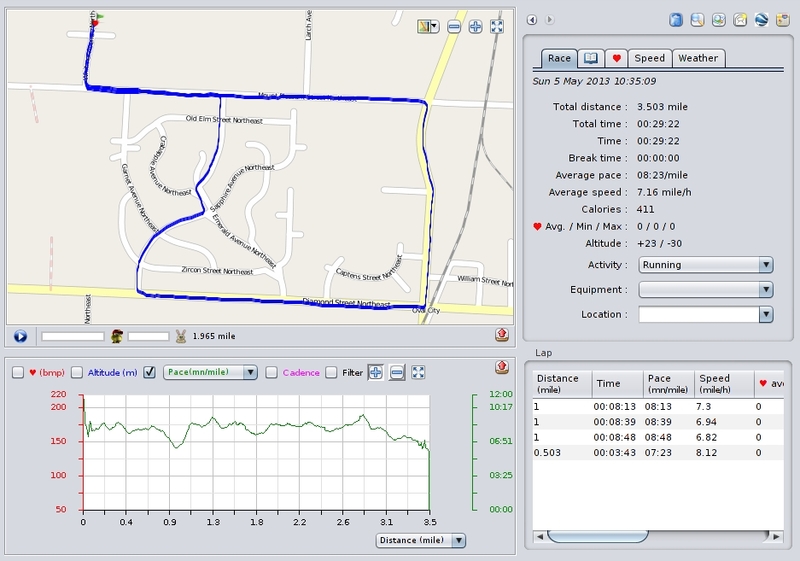 My best average pace of the year for this loop, and the first time I’ve cracked the 30-minute mark on it. And this surprises me a bit, because I ran this one in the direction that puts a big climb 2.5 miles in, but that green pace line is pretty steady most of the way, until I tried for a bit of boost at the end. This time, I ran down that hill (and into a steady headwind) at the end of my first mile – and it looks like I had a much tougher time keeping a steady pace – again, until the last half-mile push. I never felt like my speed was varying that much, which is a bit weird, but there it is. 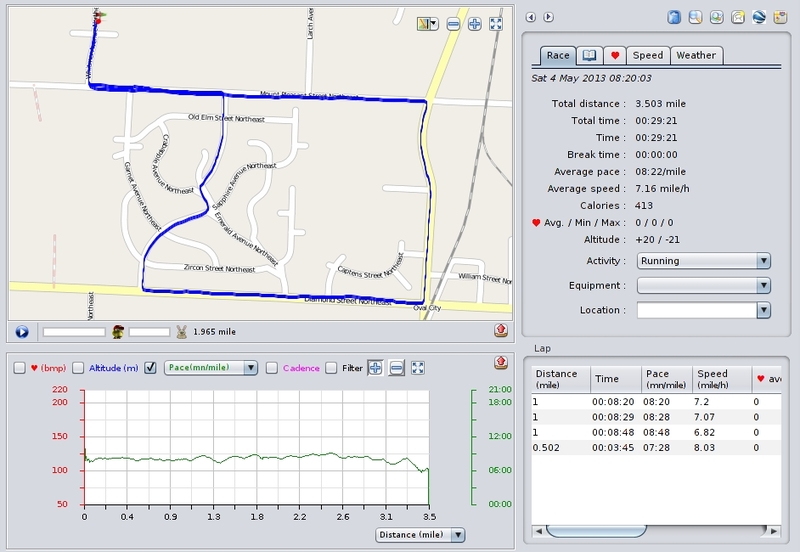 And overall, I came in a second slower than the day before, but still better than any other 2013 trip around this loop. Because I’m not running four days a week like I do when I’m preparing for a race, I’ve really felt like it’s been a struggle to improve my pace, but this weekend reminded me that I have also been varying my courses, so I don’t always have an apples-to-apples comparison. I’ve run this loop more than a dozen times, though, and looking back, I’m finishing about 47 seconds faster than I did back in January, so I guess that counts for something. Also: 129.2 miles for the year. There’s yet another robin’s nest above our front porch light this year. 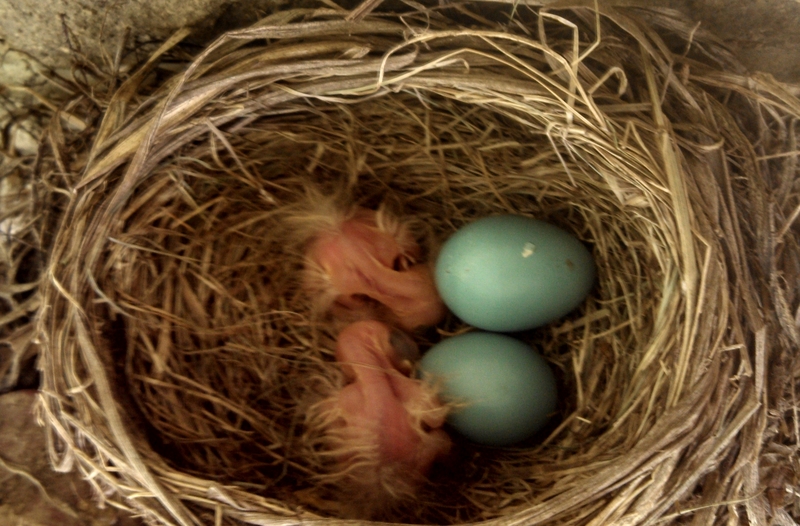 Yesterday, there were four blue eggs in it. When I got back from my run this morning, I noticed a piece of blue shell on the concrete. I don’t think I’ve ever gotten a photo of hatchlings that I’m absolutely certain are less than a day old, or that includes the newbies side-by-side with unhatched eggs. (And it looks like #3 might be arriving soon, if I’m judging the chip on that egg correctly.) The picture’s a little blurry, but it’s difficult to shoot into the nest sight unseen, and I didn’t want to cause any more of a disturbance.